I released two core books in 2013. Demon: The Descent is a game of techgnostic espionage, where you play a rogue angel who’s defected to the human race. 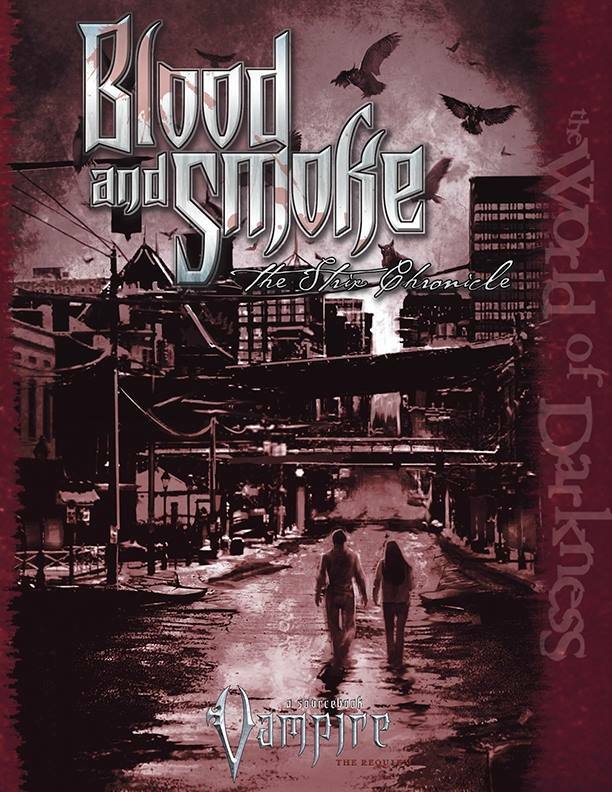 Blood and Smoke: The Strix Chronicle is a standalone update to Vampire: The Requiem that revitalizes the game’s focus on visceral drama and personal horror. Deeper personal reflections on these might be in order at some point. Demon is my game about the masks we use to get through daily life, the different identities we adopt with our family and friends. Vampire is my game about the difficulties of adult relationships, and what happens when they slide into exploitation. I also stepped up as Onyx Path’s development producer, coordinating the schedule and all products in the manuscript process. That’s been an interesting road. While our project lifecycle is similar to that at White Wolf until the PDF/print stages, the work environment is totally different. For a company that’s spread out across the Western world, much less one composed mostly of freelancers, you have to take a very different approach to managing teams. I’ve learned a lot from software development here, and am continuing to work on refining the process. Cavaliers of Mars is running late because of all the WoD and administrative work this year, but it’s moving along. The core system works, and merely needs some additional playtesting for recent tweaks, and sections of the corebook (like the bestiary) still need writing. Onyx Path is still lined up to publish it as our first creator-owned project. I’ve been doing a lot of game hacking this year that hasn’t made it to Fantasy Heartbreaker. I’m not sure how I feel about that. I tend to get more feedback over on Google+, but I think people’s eyes glaze over faster when I start to get into detail. I’m rather attached to my blog, but when you’re doing game design, feedback is fundamental. For example, I got way more comments on my space opera hacks of Cortex Plus Action there than here. My latest small hack is Mouse Guard to run a game in the spirit of Hero’s Quest/Quest for Glory. Mayhap I’ll post more on it here, but the G+ issue lurks there. I don’t know if anyone’s still bothering to comment here after my long silence, but if so, what are your opinions on the social network/blog divide? Aha, I wondered why you never updated this ‘blog any more! I’m now following you in G+. I don’t really have any useful input about commenting… which is why I so rarely commented here. But I definitely enjoyed reading your thoughts about mechanics / systems! I was gutted to find out I’d missed the Demon Kickstarter – I’ve been trying to get a deluxe core book for all the new WoD games! But it sounds great and I will pick it up. 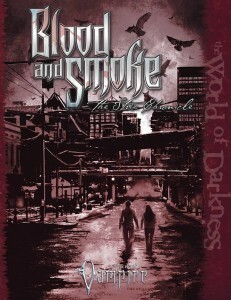 I have bought the PDF of Blood and Smoke and started reading it; I like what I’ve seen so far! I don’t really use Google+; like most people I suspect I go to where my peers are, and most of mine are either on Twitter or Facebook (I prefer Twitter, though I do have a small number of friends who are on both). Blogs are good as a hub, and so you can find stuff later; Twitter and Facebook are no good for searching for things long after they’re done, so you have to be sure to archive important stuff somewhere else. Blogs on the other hand have everything in one place, and you can easily archive or backup the whole lot if you need to. So I suppose I’m a vote for blog? Now I’m writing more, I’m going to revitalise my own blog and start posting my own games there. But I will make sure I’m following you on G+!